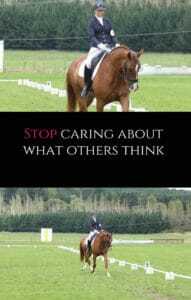 The world of dressage and horses in general, has a lot of people with opinions and strong ones! Heres the thing, just as everyone has a mouth, everyone has an opinion and if you ask for someone’s opinion, be prepared to have it thrown on you. Be prepared for the good, the bad and the ugly, because you asked. So how do you not worry about others opinions? You simply don’t ask. What someone else thinks of you is none of your business. Now I’m not saying don’t ever ask opinions, there is a time and a place. The key is to choose when to ask and who. The problem lies when we let other peoples opinions and worry about what other people think hold us back from getting out there and just doing it. 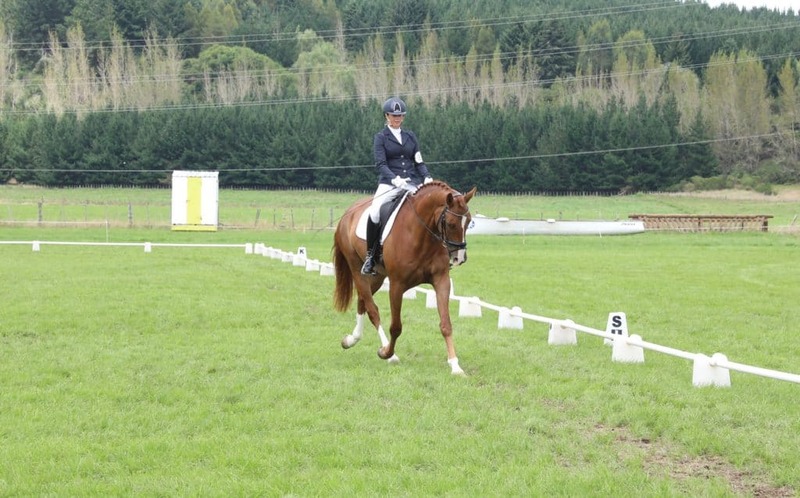 In dressage we are trotting down a centre line and asking someone’s opinion on how our training is going at this level. We have paid to enter into that show, to get a trusted and experienced persons opinion. So in that time and place that opinion matters and that is a time where you take the feedback and grow from it. No matter whether it was good or bad. As hard as it is though, you have to remind yourself who opinion matters and to shut down that voice in your head who is worrying about what other people think. I am certainly not immune to this and putting yourself out there every day online I care. The problem is I care far too much about what people think, but at the same time I equally don’t care, because I care more about helping people and more about achieving my dreams. You see you have to prioritise and those thoughts will always come streaming in, but I have learnt to pop them on mute and stay true to my goals and what I want to achieve. It takes practice and I don’t think anyone is immune. Remind yourself why you are doing it and what your goal is. If your goal is to just head out to a competition and arrive safely back home again on the other side. Then that’s what you focus on, nothing else and enjoy making that happen and enjoy being out and about giving it a go. Learn from that experience and build upon it. The more you just get out there and do it, the more confidence you will gain, the more experience you and your horse will gain and the better the two of you will get together. Sometimes chasing our goals is scary, but the truth is facing those fears is what helps us grow and everything we want is usually on the otherside of fear. So embrace being uncomfortable. This is where the magic happens. I guess my point of this post is about getting on a journey that sits right for you. Too often we let fear get in the way and I don’t want this to happen to you. I want you to thrive and have fun along the way. Life is short and if your goal is be the best dressage rider you can be, then you have to be brave and get out there. So read books, get great instructors, search out the knowledge and advice to help you on your journey. No matter where you are at. Then get on that road and work on YOUR path to success. Surround yourself with the people that will help you get there. It can be way to easy to get stuck and stop growing because of the fear of what other people think. We let that fear stop us going out and competing because you fear you aren’t good enough or you fear what other people are saying. Those people that matter are saying how awesome it is to see you out and about. Those people that don’t matter, you don’t care what they think, because its none of your business. Remember everyone has an opinion. The key is to surround yourself with people who support you and encourage you on your journey. Those that have positive things to say and those people that you trust. Make your journey one you love and enjoy every minute with your amazing horse. It’s building your relationship with your horse that truly matters at the end of the day. Build your confidence up off the horse and surround yourself with a supportive environment to help you succeed. Get started today with our free guide and start working on your riding fitness off the horse. Download it here.